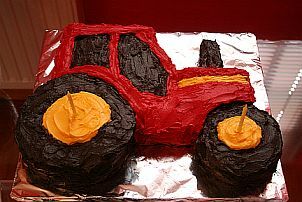 This page has some ideas for kids birthday cakes for your next toddler party. There are 2 options: bought or homemade, depending on whether you are cash rich/time poor - or the other way round. 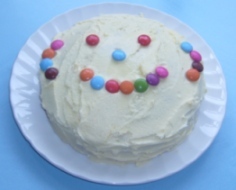 This is one of the easiest first birthday cakes to make, as all the ingredients can just be bought ready made. You don’t need to go anywhere near an oven if you don’t want to! To make the train cake, start off by putting a thin layer of honey or jam over a cake board. Put some baking coconut in a bowl & add a few drops green colouring & mix until the coconut is evenly green. Sprinkle over cake board & shake off remainder. Break three 4 finger kit kats into fingers, and make them into a train track across the cake board (if using square board put diagonally across). 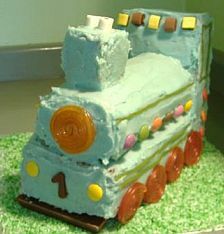 Get 2 loaf cakes (these can be ready bought), place one on top of kitkat track to make body of train. Stand the other one up on its end at one end of the other cake. They can also be sliced & filled with buttercream & jam if desired. Get a ready made Swiss roll and place on top of the horizontal loaf cake. Make buttercream and put a few drops of the desired colour in. Cover entire cake with buttercream. 6 or 8 licorice Catherine Wheels for wheels (3 or 4 on each side). Cut small strands of licorice shoelaces to make windows, and stick smarties or other sweets on as desired. 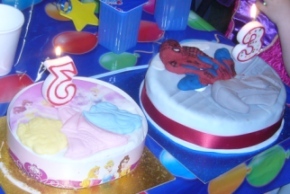 If you are short of time, there is a good variety of off-the-shelf kids birthday cakes available to buy. No need to feel guilty - your toddler is hardly going to pout in disappointment and start complaining! 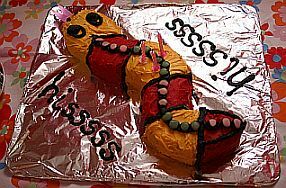 There is no right or wrong, homemade or bought, but children nowadays, do expect to see a cake at a birthday party, candles to blow out and that all important wish.